One minute Serena and Santi are all smiles with the power of the ATV moving down a dirt trail only to have their world turned upside down in a second as the ATV is turned over and mother and son are gravely injured while just trying to be active and recreate together. Serena has many devastating injuries to her face and spine that required 2 weeks of hospital care University of Alabama-Birmingham Hospital and to date is still recovering ? Santi required staples to mend a gash in the back of his head? He was in much better shape than his mother, so it appeared. Santi returned home after a few days while his father John stayed to take care of Serena who had a number of complicated medical concerns stemming from the accident. I have coached kids in NC for more than a couple decades and our program has had more than it s share of heartache and heart break! Three different young former junior players have passed to the other side while in their early 20’s, from Charlottes program. One of those, Brandon Cook was killed in an ATV accident with family in Mexico! So when I had received word of Santi’s accident I was shaken to say the least. Surely not again! All seemed well after he got home. It did not take long before Santi started to feel ill. Before his mom could even get home Santi ended up in a local hospital. Seems he had a hole in his bladder that distributed a toxic attack on his entire body. He became very sick and went into a coma and was not responding. This little dynamo full of life and social interaction was fighting for his life. It is still unclear that his hole in his bladder was due to the accident or just fate that was waiting to happen anyway? Tubes and more tubes invaded his body. 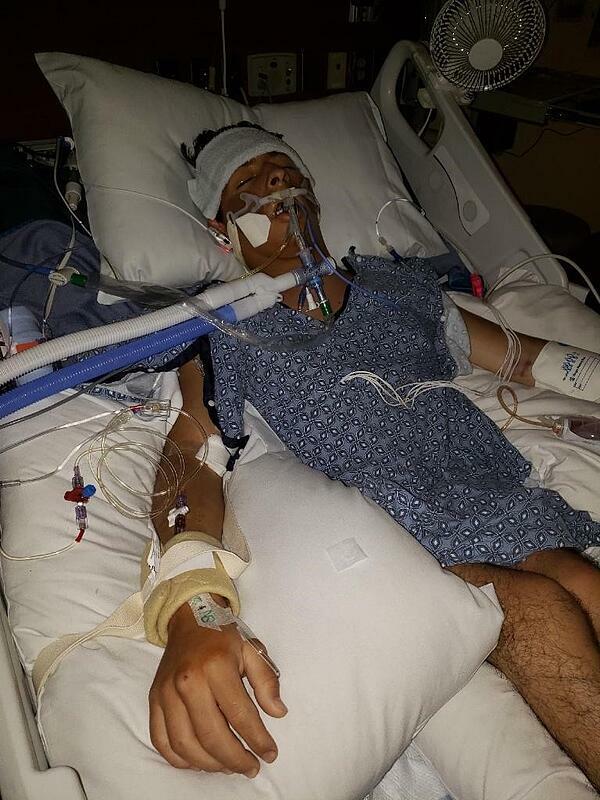 He needed a breathing tube as he labored to rise above his medical challenges all while in a coma. It came down to multitudes praying for Santi and his Hornet Family all waited with pins and needles to see when he was going to respond to treatment. He fought the good fight and started to recover slowly. He missed his graduation but in the scheme of things that was something God was all over and this is where this story of tragedy gets turned around. Not only is Serena getting back to normal slowly, but surely so is Santi. 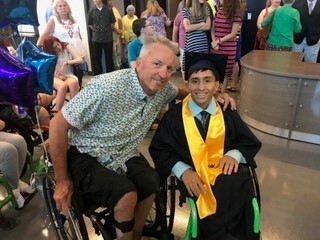 Santiago went to high school at South Iredell High School in NC and his teachers, administrators and fellow students planned a graduation ceremony for this young man. The turn out was off the charts. Student friends in cap and gowns showed up in large numbers to support Santi and see him go though his graduation ceremony like they all had done two weeks before. Family and friends in attendance to honor his a achievement and close call with death. It was powerful to witness. All the love that Santi deserved and received was truly ‘Spiritual’ ! He beamed with pride as he felt the outpouring of support from his community. Local TV stations covered this feel good story. 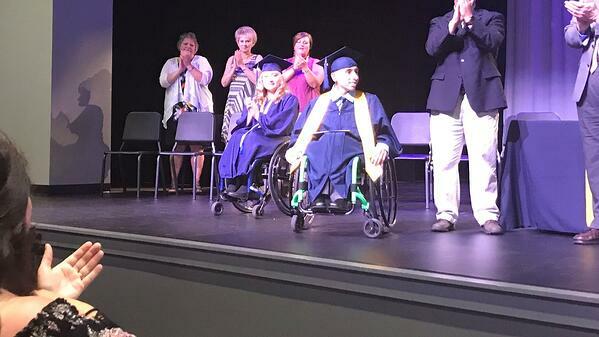 An incredible act of love and kindness from his high school. 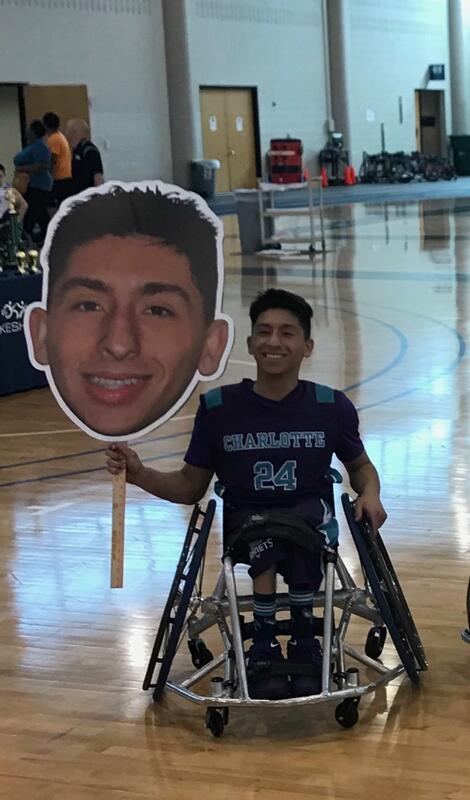 Santiago Rueda, you are an inspiration to me and your love for basketball is second to none I’ve seen. You have a very bright future and I’m grateful that you allow me to be part of your ride! I hope this blog and story gets shared everywhere. It’s this kind of triumph of the human spirit that the world needs to know about. Peace Through Christ and Hoops.